Wellington - Loose forward Jerome Kaino re-signed to play in New Zealand for a further three years Tuesday, as the All Blacks look to shore up their stocks post the Rugby World Cup this year. "This is a huge announcement for us. Jerome is one of our leading players and the first to re-sign through to 2018," New Zealand Rugby chief executive Steve Tew. "While we will see players depart our shores, we are buoyed by the news which demonstrates that the rugby environment we provide here in New Zealand remains stimulating and attractive to our top players." The All Blacks are already resigned to an exodus following the September-October World Cup in England with Dan Carter, Conrad Smith and Ma'a Nonu heading the list of players taking up lucrative contracts in Europe. The 56-Test Kaino, 31, was New Zealand's player of the year and a nominee for world player of the year in 2011 and played in every game of the All Blacks' World Cup victory that year. He then played two seasons in Japan before returning to New Zealand last year. 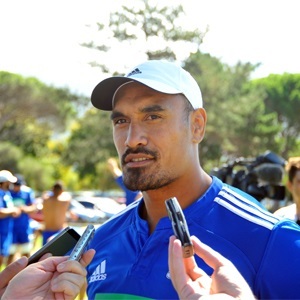 "Having been overseas and experienced that, home does have a lot of positives," Kaino said. "I am also driven to be part of the All Blacks again. There's no greater honour than to wear the black jersey." Current All Blacks who have re-signed beyond the World Cup include Kieran Read, Owen Franks, Sam Whitelock, Cory Jane, Israel Dagg, Aaron Cruden, and Sonny Bill Williams.